Hi all, a couple of weeks ago I was very lucky to win a competition on Sineads fabulous the beautiful truth blog. 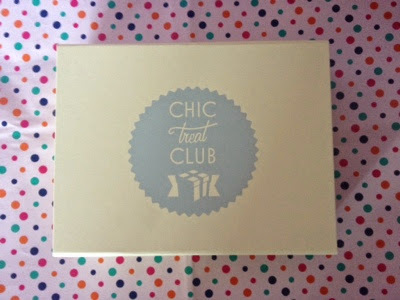 The prize was a bespoke Chic Treat Club box which was to be made up of the most popular items from the last few boxes. What an amazing prize! This is what I got in my box and how I got on with it. So I got 5 full size items in the box only one of which I had ever used! I will start off with the one I had used before which was impress nails. I love these nails they're amazing I had actually done a review on these already which you can find here I was definitely delighted to get another set and especially in such a nice colour! Next up was the sleek eye dust which was in a green. I haven't used this I knew by looking at it it wasn't for me so I gave it to a teenage friend and she was delighted with it. Next in the box was inecto pure argan hand & nail cream. This smells really nice and is lightweight and fairly non greasy it dries in pretty quickly too. This has earned a place beside the kitchen sink where it will be used very regularly throughout the winter. Next up is the cleanse off mitt which I won't go into too much detail on as I have it in the pipeline to be part of a different blog post. The final product in the box is the NYX push up bra for eyebrow. I thought this was a bit of a weird name but heyho. It says that the colour will flatter any eyebrow shade and I was happy with it as being blonde most eyebrow products come out very orange this wasn't. The other side is a highlighter but I wasn't too impressed with it as it had no shimmer at all it was more like a pink eyeliner. This pencil was ok but was hard enough to put on as you had to press a bit for colour.